PJ and Noah just got married! Anyone who's ever been to a wedding knows that one of the reception traditions is the first dance as a married couple. 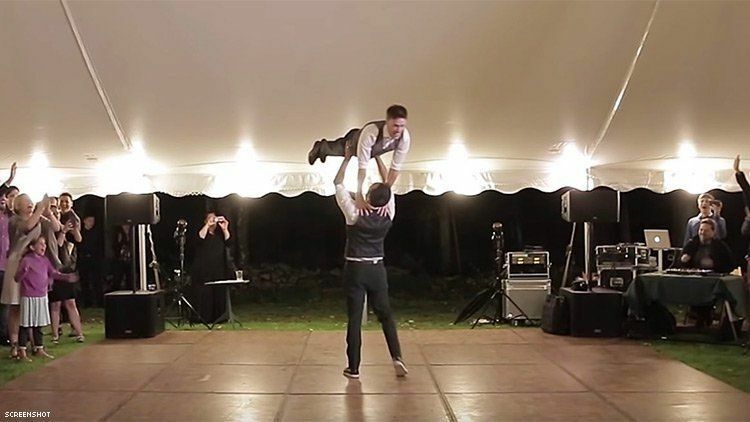 These two grooms took it to a whole new level with a complex dance routine set to a medley of hits, old and new alike. The whole thing was captured for posterity and uploaded to YouTube. It starts off with the expected awkward slow dance. But with a quick cue to the DJ, the medley began, allowing them to show off a wide range of styles, from Gloria Estefan's "Conga" to Madonna's "Vogue". But the pièce de résistance came at the end when the music shifted into the iconic song "(I've Had) The Time of my Life," with a Dirty Dancing style lift that would make the late Patrick Swayze and Jennifer Grey proud. There was this fun Yoga twist on it. And even stuffed animals have gotten in on the fun. Not every attempt was particularly successful. But to be honest, a lot of them were pretty impressive. But none quite as impressive as PJ and Noah!